There are no free tax appointments available in Lebanon County for this year; all appointments have been taken. Click here for potential out of county resouces for free tax preperation services. Lebanon County residents with a household income of $54,000 or less are eligible for free tax preparation services offered through the VITA program of Lebanon County Money in Your Pocket Coalition at three different sites. IRS-certified trained volunteers will prepare taxes at no cost. Residents can schedule free tax prep appointments for through April 12, 2019 by calling Lebanon County Community Action Partnership at 717-273-9328. VITA volunteer tax preparers are specially trained by the IRS to find low-to moderate-income households the maximum refunds they are due. Individuals and families that use the VITA free tax prep sites also receive their return quickly, don’t have to worry about hidden fees, and can take advantage of all qualifying tax credits. Tax preparation sites this year are located at Lebanon Valley College, HACC Lebanon Campus, and Grace United Church of Christ. Appointments are required, so please call Lebanon Valley College at 717-867-6054 for appointments at LVC. All other appointments, call Community Action at 717-273-9328. If you anticipate a refund and want direct deposit, bring your bank account number and bank routing number. If you want VITA to e-file your PA tax return, please bring any information you received for your PA tax return. While VITA can’t e-file a local return, they can prepare it and make a copy. Bring your local tax form with you. 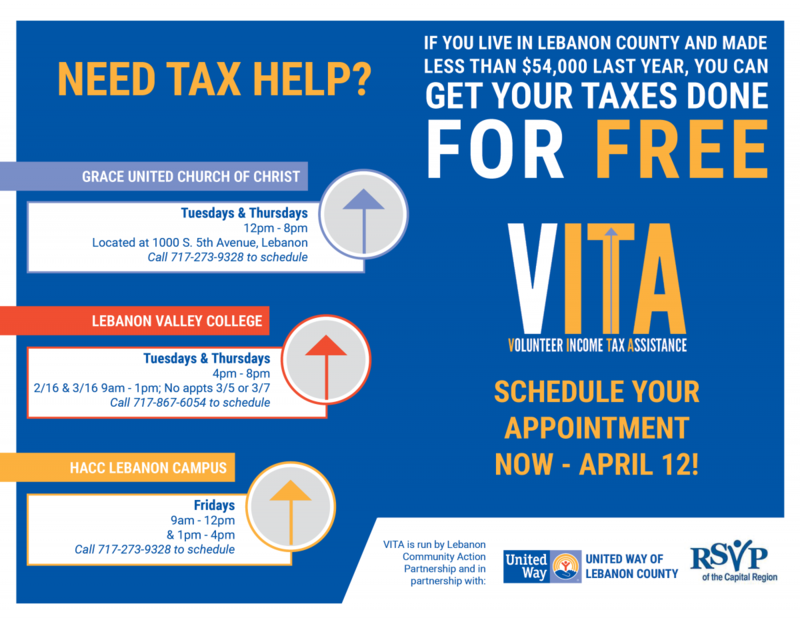 For individuals who live outside of Lebanon County, visit https://irs.treasury.gov/freetaxprep/ to search for a VITA program near you. Want to Prepare You Own Taxes, But Need Additional Resources? A printer to print your information? P.R.O.B.E. (Potential Reentry Opportunities in Business and Education) is offering their resources for two days! Gather your paperwork and head to P.R.O.B.E. Additional days and times available by appointment only.